14 May Our kit is on its way! My Green Trip’s first crowdfunding success! Read the full story. In case you have missed our massive April spamming (or live on the moon), we have great news to share: we have launched our first ever crowdfunding campaign and raised over CHF 7,000 in just 30 days . End of last year, we informed you about our super cool and eco-friendly clean-up kits we wanted to create. This year, we decided to make it happen. To help us, we successfully launched our first crowdfunding campaign. The money aimed to help us to start the production and distribution of the kits via events and clean-ups with our community. The objective was not easy with an initial CHF 5,000 to be raised for our first 1,000 kits. Moreover, as big lovers of nature and (sometimes) sport, we have decided to challenge our team to run the Marathon races of Lausanne and Geneva taking place in the same month to support our campaign. The result was stunning: CHF 7,095 raised (1.4x our initial goal!) and a total of 30 green runners ! A massive “Thank You” to our 117 supporters and our photographer Jonathan Berserth for making this possible (and unforgettable!). 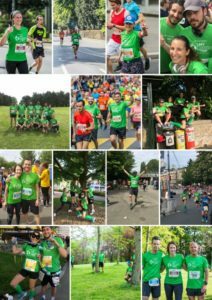 And a special Big Up to SQRLWEAR for making our green runners so fashionable with their T-shirts!